Wind howling around the cabin shook and rattled the windows and I expected to find a foot or so of snow on the ground when we got up. But it wasn’t really that cold out—at least not until we started on our hike on Chimney’s Trail. Gusts up to 30 miles per hour from the northeast made for a rather miserable walk and so we turned around after about a hundred yards and headed down to Castelon. Here we spent a pleasureable hour talking with the volunteer, trying to find the local cemetery located behind the park store, and ate our lunch at La Harmonia–a defunct store owned by Cartledge who promoted business between Mexico and the US—and died in 1961, still living on the property. Our lunch was quite tasty–being made with fresh wheat bread by the Roadrunner Deli–a StudyButte Club. The wind seemed to have died down and so we tried again for the Chimneys. 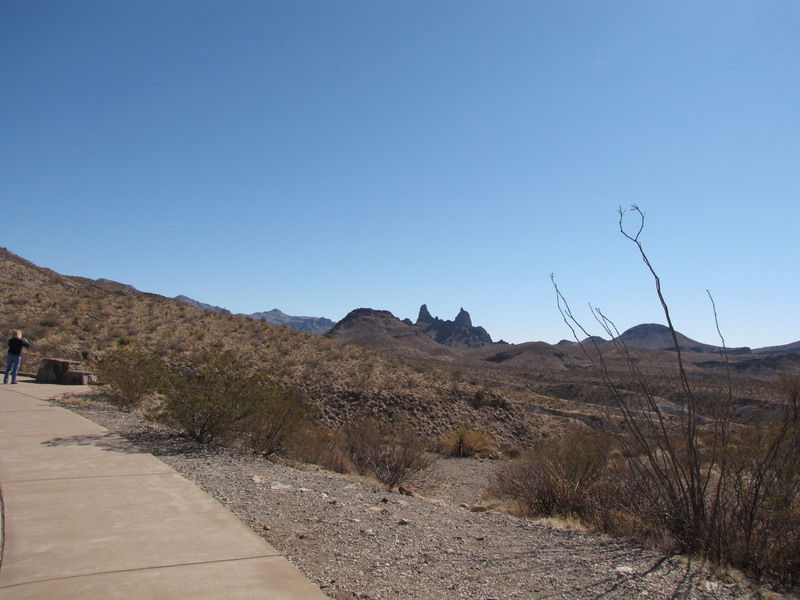 It is advertised as a flat desert walk without shade—but it is all downhill–meaning it is all uphill on the return. Fortunately there are no steps just a few washes to walk down and up. We had hoped to see some javelinas but they were probably all taking a midafternoon nap. We did see a large bird that we think might have been a juvenile northern harrier. Binoculars had been left in the truck—and the good bird identification book was at home–another thing we wished we had brought. I took photos of the prickly pears along the way being impressed by the variety of color–deep rose, scarlet red, orange, lavender, and dark purple. I tried to think of ways I could dye fabric using the materials at hand–but my feet were too tired to let me think. We stopped by Study Butte General Store for some diesel and supper fixings–and watched three children sort through three big boxes of stuffed toys left on the bench outside the store. Carrying all our paraphenalia into the cabin took about ten minutes; I squashed up an avocado, squeezed half a Meyers lemon, and added half a can of tiny shrimp for a meal of chips and dip. Early to bed tonight–my feet are beat!